The Kabala School building is attempting to get a final coat of paint, however, heavy rains of the season have begun and finding a space of time that remains dry long enough to complete the task...is to say the least..FRUSTRATING! The above photo is a rough estimate of how it will look when painted. We are not sure the paint is exactly the colors we see in the photo, however, the painting crew is trying to get it as close as possible. 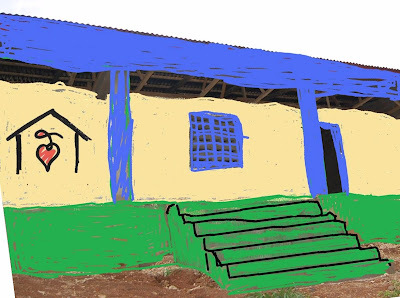 When James is up to making another visit to Kabala, he will report back to us the actual photographs of the painting job. Please pray and hope that the weather gives them a break.